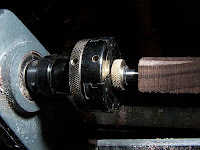 Here's a photo of the mandrel being used correctly. I had it between centers in the previous article and using the drill stop instead of using a brass nut. I'm unsure of the wood being used there, probably a rosewood of some kind. 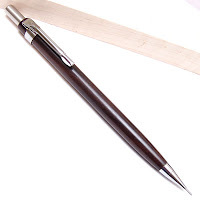 But here's the completed Pentel based pencil. 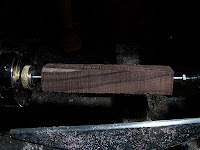 And finally, an action shot of the HF 2" Scroll Chuck I reviewed here. It runs absolutely true and was a great purchase. I have some segmented blanks lined up for these pencils that I'll get to next weekend. It looks like you are holding that by the thread end in the chuck. If so, how are the threads holding up from the clamping pressure? Pretty munged up. BUT the key is to put the knurled brass nut on BEFORE mounting it to the chuck. Then as long as you leave 1/2" or so of the threads untouched, you have enough travel to work with. The blank is mounted from the other end anyway.